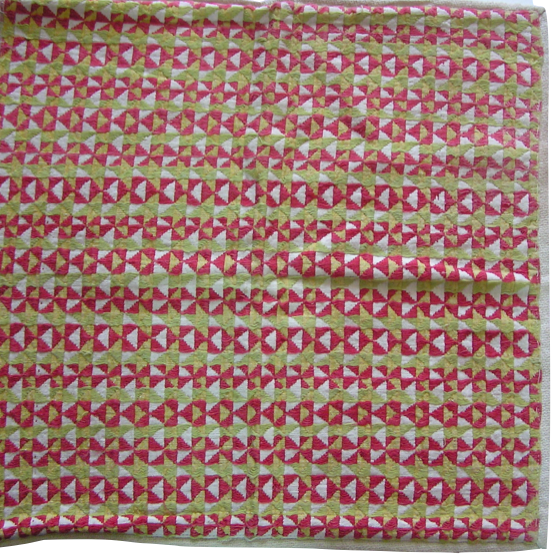 This Itneg/Tingguian blanket, woven in the dinapat style, shows that even without varying the breadth of the warp and weft yarns, patterns other than checkered or plaid designs can be produced. 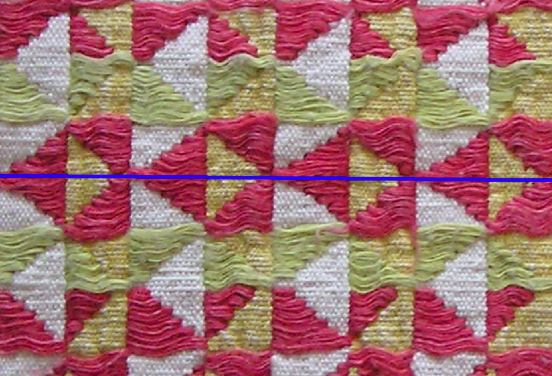 The skillful interplay of green threads in the warp and weft creates an illusion of pentagons; while the manner in which the weft yarns are inserted produces isosceles right triangles. There are no vertical reflections, but there are horizontal axes of reflection passing through the vertex of the isosceles triangles whose bases are vertical. In addition, the points at which pairs of isosceles red triangles intersect at their respective vertices are centers of 180-degree rotations. The symmetry group of the repeating planar pattern is pmg.